The LX90-SCcan do more than track satellites. It talks to them as well. Turn it on and the built-in Sony GPS sensor immediately determines your precise date, time and location. AutoAlign then uses this info to align your scope for a tour of the most spectacular sights in the universe. The LX90-SC optical system delivers wide, coma-free images with pinpoint stars all the way out to the edge of the field. AUTOALIGN – Telescopes with Meade’s new AutoAlign come pre-aligned. They are smart scopes that know the night sky right out of the box. AutoAlign picks two fail-proof alignment stars for you and places them right in your viewfinder. Just center them to fine tune your alignment and the wonders of the universe are at your fingertips. SLEW SPEED – The LX90-SC slews (moves) from star to star at 7 degrees per second.That is more than twice as fast as the competition.This means that over the course of an evening, a Meade LX90-SC will show you two to three times more objects. RIGID CAST ALUMINUM FORK MOUNT – The Meade LX90-SC's Optical Tube Assembly is mounted on two sturdy fork arms giving you a rock solid platform for astrophotography. LX200 - SERIES TRIPOD – The LX90-SC comes standard with the same sturdy field tripod as the LX200 series telescope. OVERSIZED PRIMARY MIRROR – Only Meade manufactures their primary mirrors in diameters larger than their listed aperture (e.g. the diameter of the 8" LX90’s primary mirror is actually 8.25"). This additional 1/4" yields a wider, fully illuminated field-of-view, and allows you to see the light other telescopes leave behind. SMART DRIVE – Meade’s AutoStar provides Periodic Error Correction (in polar mode). Over the course of one or more training periods your LX90-SC will minimize guiding corrections during long exposure astrophotography. AUTOSTAR CONTROLLER – Meade’s AutoStar can be updated after purchase. Log on to www.meade.com to download software upgrades, guided tours and timely objects like comets, satellites and new discoveries – Free! Keep your AutoStar up-to-date, and your LX90-SC will grow with you for years to come. SMARTFINDER(RED DOT) & 8 X 50 VIEWFINDER – Quickly and easily locate and center deep sky objects. RA and Dec: 1x, 2x, 8x, 16x, 64x, 128x sidereal and 1.5°/sec., 3°/sec., 6.5°/sec. 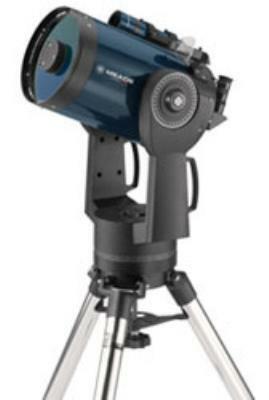 Click the button below to add the Meade 10 Inch LX90-SC Schmidt-Cassegrain w/GPS w/UHTC Coatings to your wish list.